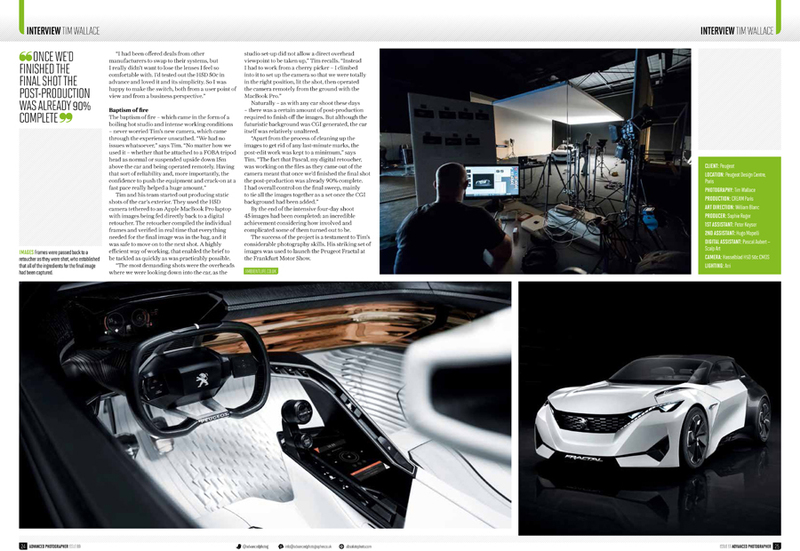 "EVERYTHING HAS TO BE DONE AS DISCREETLY AS POSSIBLE TO AVOID IMAGES OF THE CAR LEAKING OUT"
Year and UK Motor Industry Professional Car Photographer of the Year, confirming his reputation as one of the best in the business. One of the things anyone shooting pictures for the car industry realises very quickly is that there is so much competition between the various brands, and such an insatiable demand from motoring enthusiasts to hear about fresh models as soon as possible, that there’s often a high level of secrecy required to ensure that the latest launches aren’t revealed to the world before the manufacturer intends. “Everything has to be done as discreetly as possible to avoid images of the car leaking out,” says Tim. 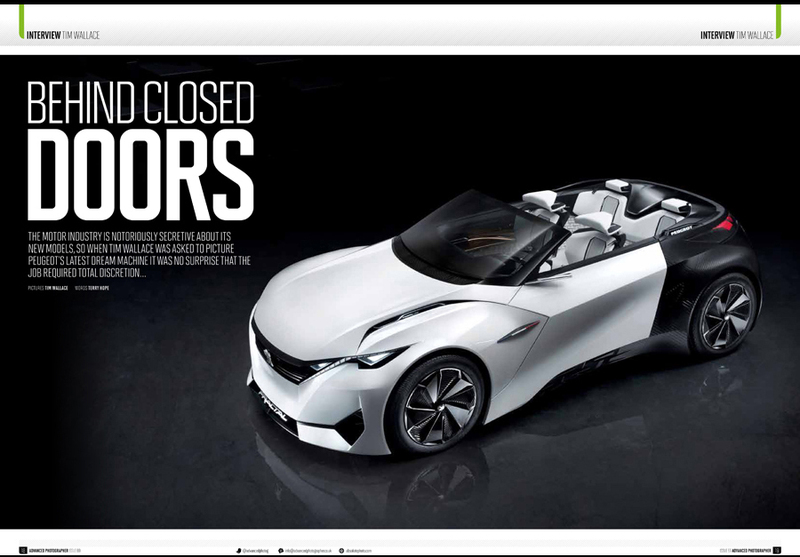 “This was why we were asked to undertake the shoot in the Peugeot’s own in-house studio, which is situated in the middle of their plant in Paris. 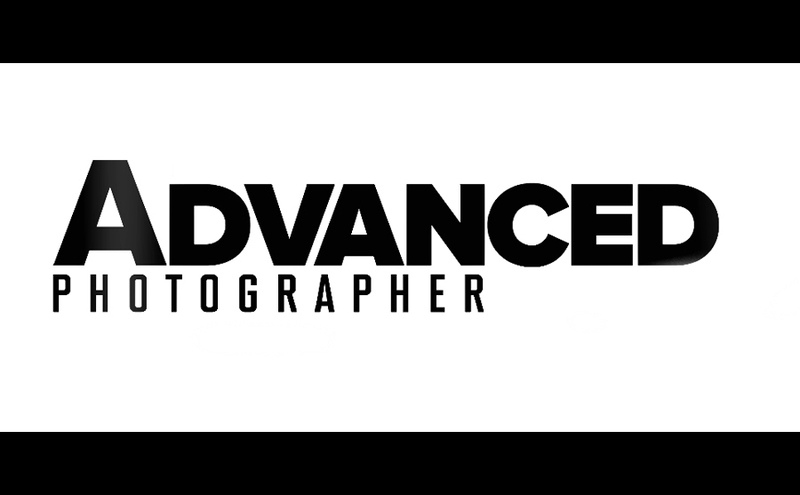 With any type of worldwide campaign it’s crucial to ensure that everything is planned and worked out well in advance, so that during the critical days of actual shooting the team is free to concentrate fully on creating and producing the photography that’s required. 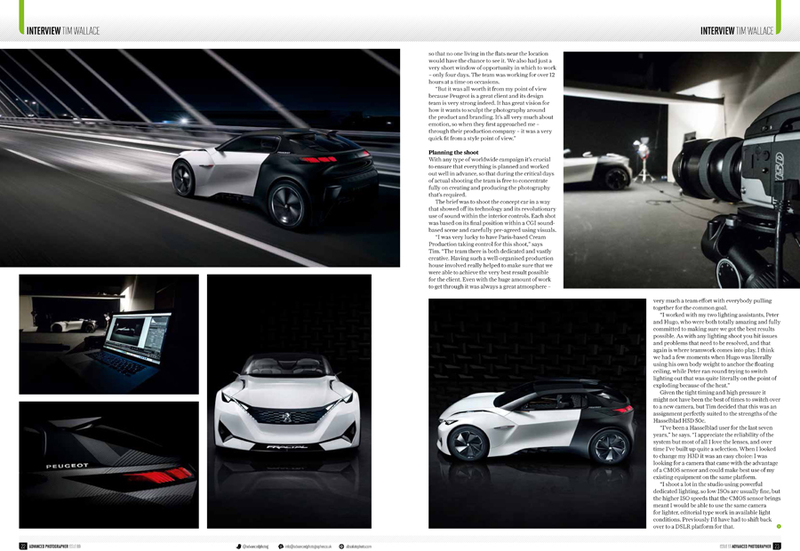 The brief was to shoot the concept car in a way that showed o its technology and its revolutionary use of sound within the interior controls. Each shot was based on its nal position within a CGI sound- based scene and carefully pre-agreed using visuals. “I was very lucky to have Paris-based Cream Production taking control for this shoot,” says Tim. “The team there is both dedicated and vastly creative. Having such a well-organised production house involved really helped to make sure that we were able to achieve the very best result possible for the client. Even with the huge amount of work to get through it was always a great atmosphere very much a team e ort with everybody pulling together for the common goal. Given the tight timing and high pressure it might not have been the best of times to switch over to a new camera, but Tim decided that this was an assignment perfectly suited to the strengths of the Hasselblad H5D 50c. “I’ve been a Hasselblad user for the last seven years,” he says. “I appreciate the reliability of the system but most of all I love the lenses, and over time I’ve built up quite a selection. When I looked to change my H3D it was an easy choice: I was looking for a camera that came with the advantage of a CMOS sensor and could make best use of my existing equipment on the same platform. “I shoot a lot in the studio using powerful dedicated lighting, so low ISOs are usually ne, but the higher ISO speeds that the CMOS sensor brings meant I would be able to use the same camera for lighter, editorial type work in available light conditions. Previously I’d have had to shift back over to a DSLR platform for that. Tim and his team started out producing static shots of the car’s exterior. They used the H5D camera tethered to an Apple MacBook Pro laptop with images being fed directly back to a digital retoucher. The retoucher compiled the individual frames and veri ed in real time that everything needed for the nal image was in the bag, and it was safe to move on to the next shot. A highly e cient way of working, that enabled the brief to be tackled as quickly as was practicably possible. 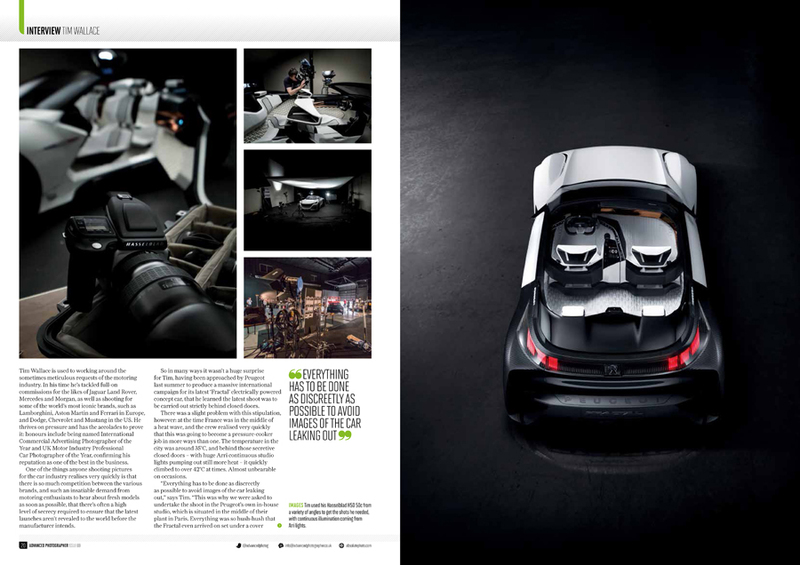 The most demanding shots were the overheads where we were looking down into the car, as the studio set-up did not allow a direct overhead viewpoint to be taken up,” Tim recalls. “Instead I had to work from a cherry picker – I climbed into it to set up the camera so that we were totally in the right position, lit the shot, then operated the camera remotely from the ground with the MacBook Pro.” Naturally – as with any car shoot these days there was a certain amount of post-production required to nish o the images. But although the futuristic background was CGI generated, the car itself was relatively unaltered. “Apart from the process of cleaning up the images to get rid of any last-minute marks, the post-edit work was kept to a minimum,” says Tim. “The fact that Pascal, my digital retoucher, was working on the les as they came out of the camera meant that once we’d nished the nal shot the post-production was already 90% complete. By the end of the intensive four-day shoot 45 images had been completed: an incredible achievement considering how involved and complicated some of them turned out to be. The success of the project is a testament to Tim’s considerable photography skills. 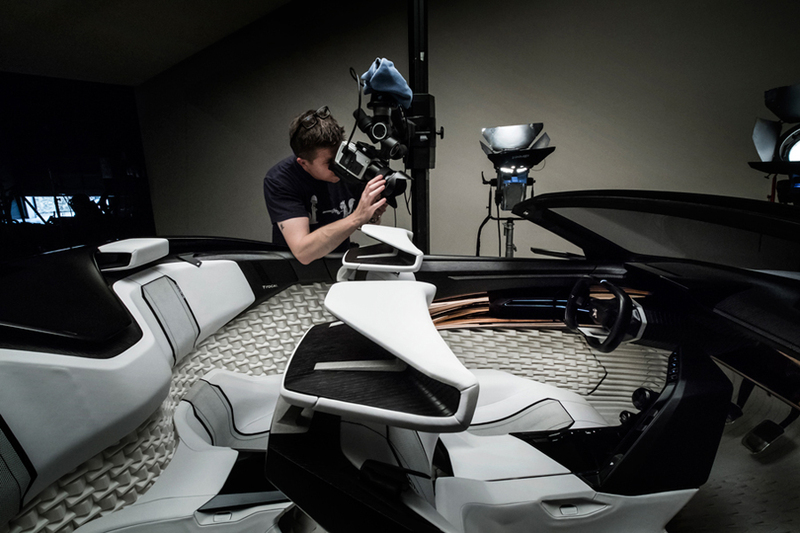 His striking set of images was used to launch the Peugeot Fractal at the Frankfurt Motor Show.